The drama around Parcel 5 hasn’t gone on as long as the drama around a new theater for the Rochester Broadway Theatre League (about four years compared to at least 20 years for RBTL). But it has certainly gotten the public’s attention. And that’s a good thing. 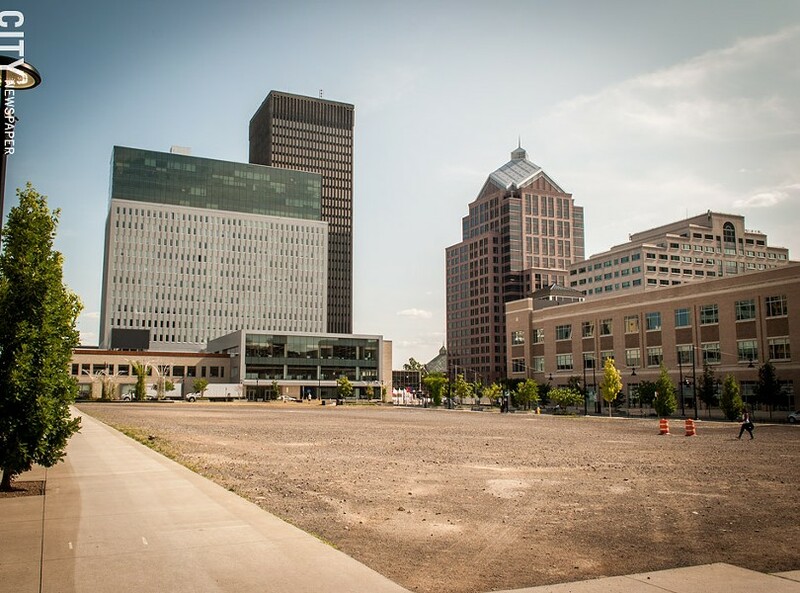 Parcel 5’s a key piece of land in a key part of downtown Rochester. The fact that people continue to argue about its use means that a lot of people care about downtown and want to be involved in planning its future. Parcel 5 used to be a significant part of the bustling core of Rochester’s downtown. And given its location, it’s also a prime development site, presumably. And yet eight years after Midtown Plaza was demolished, city officials are still looking for something to put there. The city has received exactly one commercial development proposal for Parcel 5: Andy Gallina’s plan for a mixed-use tower, offices and retail on the lower floors, residential condominiums above. The Warren administration was apparently ready to sell Parcel 5 to Gallina until RBTL added Bob Morgan’s apartment building to its theater proposal. At that point, it looked as if Warren could get three things she wanted: more downtown residents, a venue that would draw people downtown for entertainment, and new jobs. When the FBI’s investigation into the Morgan company killed the apartment building, RBTL tried to get other residential developers interested. No one has stepped forward. And now city officials are looking for other things that might work. The latest idea: an entertainment-retail complex similar to one they saw on a recent trip, Kansas City Live. As I understand it, KC Live is a big open space with a stage at one end, an arched covering over the top, and around the sides, structures housing bars, small restaurants, small retail, that kind of thing. Those uses open onto the center area and onto the streets outside. Warren administration officials think something similar might work on Parcel 5. And the center of Parcel 5 could be used for concerts, festivals, big-screen sports viewing, and other events year-round. It’s early in the city’s investigation into KC Live, and city officials aren’t ready to make a decision about it. They’ll be seeking public input – so here’s mine: If I were the folks at City Hall, right now, I’d chill. Let Parcel 5 sit there for a while. Pretty it up. Plant grass. And leave it alone for a bit. Right now, several new housing developments are underway downtown, and several more are planned. This is a region with a flat population trend. So far, the new housing units downtown are filling up, but the supply of people wanting to live downtown isn’t unlimited. And another thing: Is there a demand for a new bar and restaurant district? Or will it simply draw customers from existing businesses? Is Parcel 5 – currently nearly surrounded by apartments – a good place for bars and concerts and their late-night, often boisterous patrons? I understand the mayor’s eagerness to find something that will bring more people downtown. And city government certainly has a role in boosting development. But thanks to the city’s help and the willingness of several developers to take risks, a lot has been going on downtown. Maybe we need to let the new stuff settle in, and let demand, not hope, tell us what the next step should be at Parcel 5.